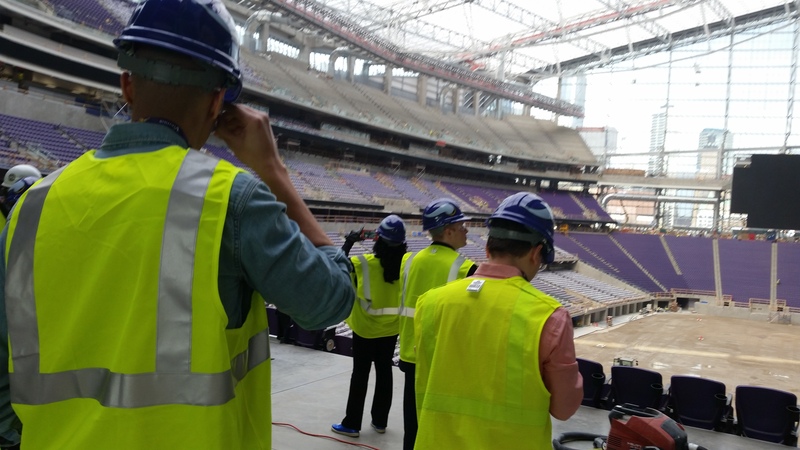 When I joined a group of journalists to visit US Bank Stadium in Minneapolis, not only was I impressed with what I saw, I had the pleasure of interviewing Brian Wolfe, HKS sustainable design manager and a key member of the architectural team for the stadium. Our interview began with my question on the destruction of the former Hubert H. Humphrey Metrodome, the site where the new stadium was built. 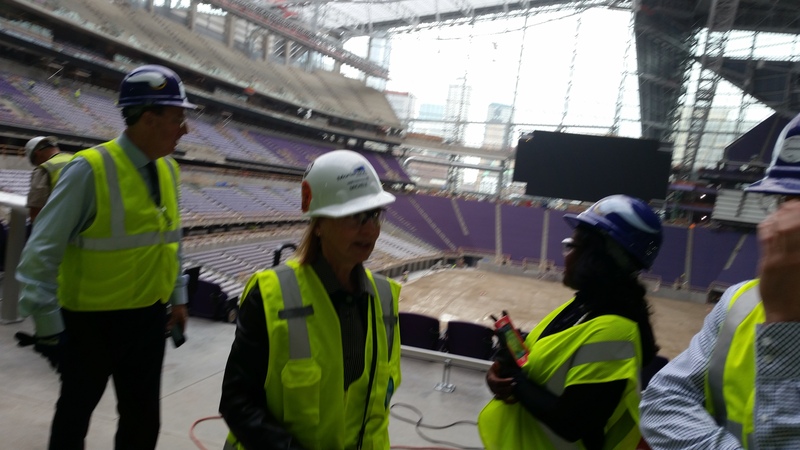 Meyers: From the demolition of the Hubert H. Humphrey Metrodome to the design of the new stadium what were your driving considerations concerning sustainability? Wolfe: The HKS team desired to create a state of the art multi-purpose stadium while keeping with the strict sustainable beliefs and goals of Minnesotans. This began with using the existing stadium site which allowed the opportunity for downtown revitalization and continued the connection with downtown amenities such as the public transit system, MetroTransit. Additionally, over 90% of the Metrodome demolition materials have been diverted from the landfill. The stadium form and materials reflect its location and is responsive to the environment, which is true sustainability. Meyers: What were some of the most difficult sustainability challenges facing this project and why? Wolfe: A significant challenge was finding ways to condition an expansive volume in an extreme climate while meeting current energy codes. This drove the team to look at innovative ways of maximizing daylight for lighting and passive solar heating and how to allow the natural flow of air to benefit occupants. A reversible ventilation system that will recirculate captured warm air from the heat reservoir at the roof when in heating mode was created. Alternatively, the system will reverse when in cooling mode. Meyers: Describe what in this project has LEED certification and how that challenge was addressed. Wolfe: The project was initiated with a target for LEED New Construction Certification. To HKS, LEED was not the driving force for sustainability. Smart, sustainable design that looked at sustainability holistically was the driver. The team then let the LEED points fall where they may. The project location allows fans the opportunity to benefit from numerous local amenities and a direct connection to public transportation, whether bus lines or METRO. Water reduction was achieved with the use of low-flow fixtures with sensor activation. A healthy indoor environment was created with products and materials having low to no Volatile Organic Compounds (VOCs). Meyers: Elaborate on why ETFE was used for this project. Are you satisfied with the material and will you again recommend it? The material’s versatility allows it to be used in various situations and it is anticipated to be used more extensively on US and international projects. Meyers: From a standpoint of green building, compare this to other large entertainment complexes in the US. 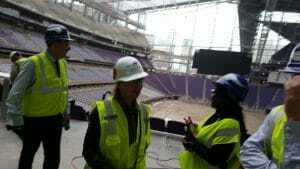 Wolfe: US Bank Stadium will be one of the most sustainable domed stadiums due to the maximized use of natural daylight, extensive use of LED lighting and LED sports lighting, use of passive solar heating and reduced steel tonnage for a location that has the highest dead loads due to snow. Additionally, the stadium will provide a healthy environment with the use of low-VOC products and materials and a cleaning and pest management program that will utilize products that do not harm the environment. Recycling has been and will be a focus of the project from the demolition of the Metrodome to the recycling of construction and operational waste with the inclusion of a composting program. Visitors will be offered tours of the stadium that will not only point out special design features of the stadium, but will also include a sustainable education component that will highlight sustainable strategies that were implemented. Meyers: How effective is ETFE from a cost standpoint from both material and installation perspectives? Wolfe: There is no other transparent material that could have been used in this long-span application at its price-point – installation was efficient allowing over 200,000 sq/ft of roof to be installed in approximately 4 months. 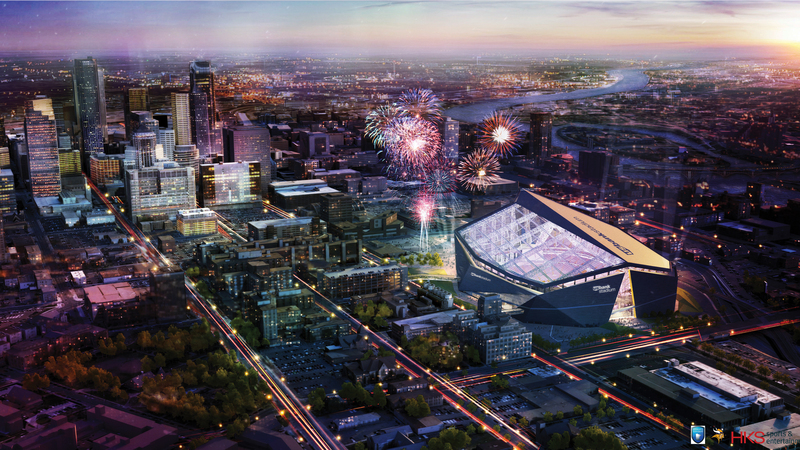 “One of the most prominent design elements of the new home for Vikings football in 2016 is the glasswork that will feature a picturesque view of the downtown Minneapolis skyline. 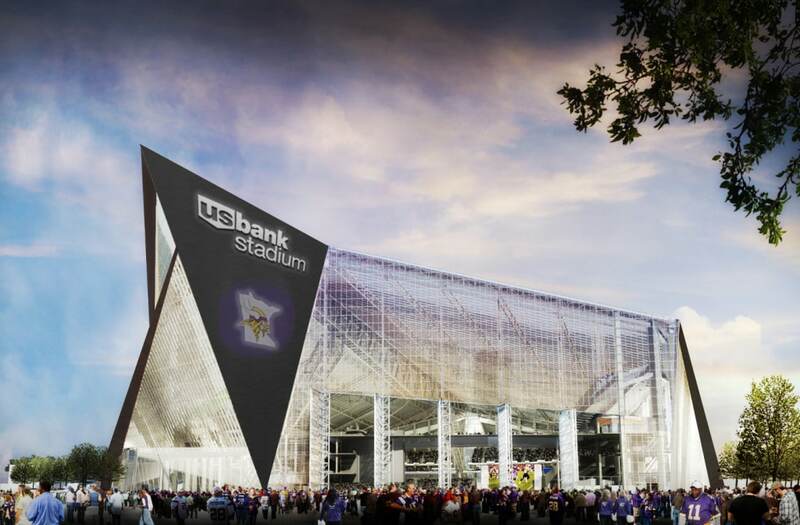 Located on the west side of U.S. Bank Stadium, work continues to ramp up on the glass curtain wall that houses the world’s largest five operable doors. 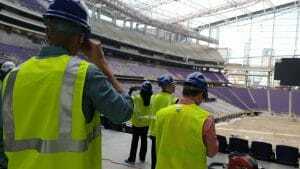 “As work continues, an LED video board will be placed on the west prow facing Medtronic Plaza.